This week Jason and Gabe are going where no other Star Wars podcast has gone before and diving head first into The Great Heep! 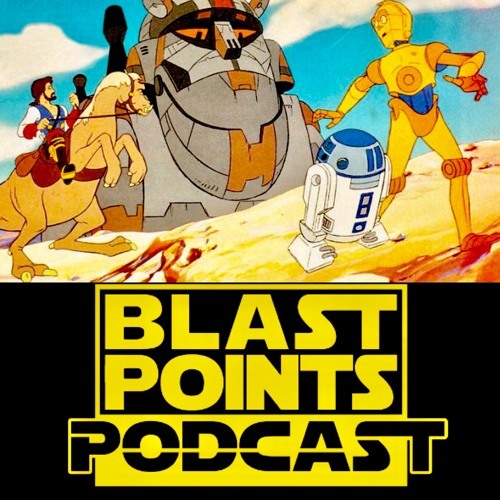 Join them as they give some Droids cartoon history and then do the first ever live podcast commentary for the weird and wild Ben Burtt written 1986 Droids TV movie! ‬ R2 falls in love! A giant droid that eats astromechs! A cyborg Imperial admiral! The magnificent Mungo Baobob! And so much more! Grab your favorite droid that wears sunglasse or painting of you with an octopus & celebrate the love by listening today! Watch The Great Heep here : https://youtu.be/neyJB_0DsYY Blast Points t-shirts are now available! Get them here: www.etsy.com/shop/Gibnerd?section_id=21195481 visit the Blast Points website! www.blastpointspodcast.com reviews! comics! recipes, articles and tons more! if you dug the show please leave BLAST POINTS a review on iTunes and share the show with friends! If you leave an iTunes review, i will read it on a future episode! honestly! talk to Blast Points on twitter at @blast_points leave feedback, comments or ideas for shows! also like Blast Points on Facebook for news on upcoming shows and links to some of the stuff we talk about in the show!! we are also on Instagram! Wow! your hosts are Jason Gibner & Gabe Bott! contact Jason at Gibnerd@hotmail.com May the Force be with you, always. Download Episode 74 - The Great Heep Great Audio Commentary! Users who like Episode 74 - The Great Heep Great Audio Commentary! Users who reposted Episode 74 - The Great Heep Great Audio Commentary! Playlists containing Episode 74 - The Great Heep Great Audio Commentary! More tracks like Episode 74 - The Great Heep Great Audio Commentary!